Coxmoor lies on a sandy, pebbly strata and at around 500-600 feet above sea level, it is exposed to the north and east winds which, for around nine months of the year, generally blow in from Russia, cold and hard, across the highest points of the course. Given those conditions, some trees are better than others at adapting and surviving. In 1934-36 when the present course was -being constructed, there were no trees to be seen. Every birch, beech and pine tree that gives Coxmoor its character, has either been planted or self set during the last 60 years. Looking round the tree-lined holes today. it is hard to believe this was barren land. But as the trees have spread and flourished, so they brought their own problems and to keep Coxmoor in tip-top condition, the club is constantly seeking advice and guidance of university agronomists to ensure the foliage enhances Coxmoors natural beauty but does not endanger it. Of ten large ash trees originally planted in the boundary hedges, only three remain. Eight plantations, mainly of Scots Pine, were planted at the time and these can still be seen on the third, fourth, tenth, 12th, 15th, 16th and 17th holes. 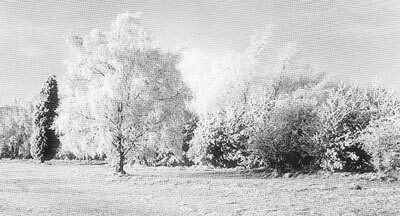 Afterwards, silver birch trees were planted in strings and over the years, the club, captains, committee, ladies and individuals have supplied, and even helped to plant and set, numerous trees around the course. They account for the wide variety which now proliferates: Larch, alder, ilex, sorbus, silver leaf poplar, willow, rhododendron, sycamore, rowan, three oaks, dog rose, elderberry, hawthorn, gorse, broom. The year that Edgar Coates was captain, Bill White travelled to Beeston Fields Golf Club with him, to fill a car with silver leaf poplar by kind permission of John Mitchell, owner of the Beeston club.Sometimes I wish we hadn't, says Bill today. they are very fast growing, and invasive, and they shed those white leaves in autumn which make ball spotting so difficult, especially on the ninth, 11th and 13th. It is a pity we don t have more flowering trees, such as cherry and lilac, which would improve the courses appearance. It is a view echoed by Alan Crafts who adds: As the course develops and the present trees die, possibly a more balanced approach will be adopted. Around 30 years ago, Lewis Shepperson planted 50 Lombardy poplar trees, but now there are only about half-a-dozen left. Down at ground level, there are a number of flowering plants that can be seen around the course. These include teasel, field scabious, Red Campion, Rose Bay, foxglove, heather, Scarlet Pimpernel, dead nettle, Scotch thistle, tansey, coltsfoot, cats ear, dandelion, ragwort, buttercup, daisy, yarrow, ox eye daisy, early purple orchid, common quaking grass, harebell and snowdrops. There is also common rush, bracken, Royal fern, shaggy inkcap, blue stalk and the pretty, but very poisonous fly agaric which abounds in the autumn. But sadly, there are no cowslips, primrose or buttercups to be seen. And, of course, there is the heather. Pretty in autumn, but often cursed by wayward drivers. However, it gives Coxmoor a unique link with one of the most famous golf courses in the world - Carnoustie. It was on a cool afternoon in 1953 that Dorothy Alberry was up on the Scottish coast watching Ben Hogan win his one and only Open championship - on his one and only visit to the competition - that she dug out a few roots of heather and brought it back to Coxmoor. Not everyone is convinced about the heather, especially when you have to hack away at a trapped ball, but they do give Coxmoor a signature that is known and remembered by everyone who plays the course. During the 1930s the first attempts at irrigating the sandrock-based course was taken with cast iron and galvanised pipes being laid. A 10,000 gallon reservoir with pumping equipment, driven by a petrol paraffin engine, on top was built by J. Searson Ltd of Sutton in a sandhole near to the water mains and Bill Drury's greenkeeping building and enclosed in what can be seen today when passing from the 12th green a the 13th tee. The spraying equipment consisted of three 3ft high and three 6ft high double-armed monstrosities which whirled round at the dizzy speed of 20 rpm. Portable, it could be hauled from green to green and connected to an underground concrete box. Such was its limitations however, a green like today's 13th would require four moves to water it completely. Another major drawback was the subsidence caused by the workings of the old Summit Colliery which ran directly beneath the course, causing frequent pipe fractures. Pressure to distant greens like 2-3-4-5 and 17 was only enough to operate one sprinkler at a time. Problems with windy conditions, evaporation due to the spraying only being carried out during daylight hours when greenkeeping staff were on duty ... and golfers moving the equipment when they wanted to putt and often not putting it back, were a constant concern. Compare that to today's sophisticated methods: electric power, plastic pipes, pop-up sprinkler heads. Sandholes were dug all over the course during the construction of the course - for greens, bunkers, mounds. Another was in front of the third tee and another deep one is to the left of the tenth green. The one Bill Drury took shelter in when the aircraft crashed on the course in 1970 is left of the men's back tee on the fifth. The final one to be excavated is at the bottom of the practice ground near the 17th tee - deep and dangerous. Owing to the sandy subsoil, Coxmoor has its fair share of burrowing animals, most common of course being the rabbit, which is a perennial nuisance, leaving its holes in the fairways and bunkers. Another constant source of nuisance because of this particular habit is the mole. The grey squirrel is also seen in great numbers, but foxes are rare, although occasionally seen around the seventh and 12th fairways. At one time, grasshoppers and also frogs were prevalent around the course, but no longer. Every summer, the ditch across the 14th fairway used to be full of frog spawn but there is very little evidence of breeding today. As for bird life, the story is even more disappointing. having long ago fled the nest, never to return. The lark has all but vanished, as has the green linnet. During the 1950s and '60s, they nested in great numbers in the gorse bushes. The partridge is another bird that has been driven away over the decades, from the time when coveys of 10 to 12 used to abound during the summer. Flocks of starlings still settle on the fairway and Hollinwell's rook colonies sometimes wing their way over to Coxmoor for a visit, but the lapwing, which was once prolific in the field to the left of the 16th hole, is long gone. Bill White said: "Up to the 1960s, there was such a person as a gamekeeper who kept down the vermin population, and by that I mean the magpie which, to my mind, is the death knell for the small bird population, helped by the grey squirrel." One bright spot is the grey wagtail which feeds off the putting green and has been known to nest in the hydrangea beneath the office window. And of course, there is also the robin which pops out to greet members around the course. Another story from Bill's vast reservoir of memories is worthy of inclusion here. That was the day Bill was playing down the 13th fairway when a slightly wayward shot flushed a startled duck out of the undergrowth. When Bill went over to see if there was a nest, he discovered to his surprise, hidden beneath the foliage was the hen's home - complete with three eggs ... and two golf balls! The story of this strange family brood very quickly spread and eventually it came to the attention of the local BBC television station. Smelling a scoop, the station sent a camera crew to get some film of the duck nurturing its clutch of odd eggs. But when the camera crew arrived at Coxmoor, Bill would not allow them to go and film the nest for fear they would scare off the mother. Bill says he never went back to the nest to check if the ducklings hatched. We can only assume the golf balls didn't!